• Mint - 1 bunch. • Plain yogurt - 2 cup. • Whole garam masala - 10 numbers. • Black cumin - 1 teaspoons. • Fresh coriander/cilantro leaves - 1 teaspoons. • Biryani masla powder - 50 grams. • Fired onion - 1 teaspoons. • Eggs - 8 numbers. • Clarified butter - 6 teaspoons. Wash and soak rice for at-least 45 minutes or 1 hour. Boil eggs shell the boiled eggs and give four long cuts on the white portion of each egg without separating it. In a kadai or pot, heat the clarified butter or oil. And whole garam masala spices(shahi jeera, cardamom, cloves, biryani flower, bay leaf, star anise) and fry the onions until they become golden brown and add salt, cashew nuts, ginger garlic paste, green chillies, mint and coriander leaves, biryani masala and curd and cook In the same masala measure 1 (1/2) times the amount water to rice and bring it to boil add soaked rice and mix well and cook by covering till rice is done. 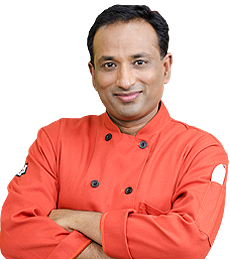 Then make a paste of red chili powder, ginger garlic paste, coriander powder, cumin powder, salt, and 1/2 an eggs, besan. Later coat the boiled eggs with above mixture and fry them with some butter until the eggs get coated with the spices. Remove the eggs and set aside.When the air holes appear on the rice surface, reduce the stove heat to low. Cook until all of the water has absorbed and the rice is tender. Top rice with eggs and sprinkle saffron water. This is the most easy and best Biryani with eggs i have tried and thanks to Vahchefs easy video instruction. Egg biryani is ideal flavoured rice with attractive aroma and full of richness. This food is among the best dishes to treat to people who don't eat meat but appreciate eating eggs. Egg biryani one of the simplest, delightful biryani that can make at home with very little ingredients. Best part when running short time and want a special meal then it’s the best one. It is one among the original feel and taste of the true Mughlai Khana. Biryani is a favourite rice dish through the Indian sub-continent. It's a spectacular recipe of a range of spices, saffron and caramelized onions, and has become the most aromatic rice possibly cooked. To all its attractiveness, this is a dish suit for being offered in the royal court. Biryani is not challenging in any way to prepare like many think. It’s just bit of time-consuming and it also requires that little extra special attention when we do it. The cooking procedure for Biryani shows up an excellence of cooking art. Eggs are among the most comfort foods accessible all-around year that not only offers yummy foods on their own but is also an important ingredient for a lot of baked items and sauces. Eggs consist a yellow yolk and translucent white surrounded by a safety layer that can be white or brown, depending on the kind of the chicken. The shell's colour isn't linked to the quality or nutrients of the egg. Eggs keep an important position not just for its amazing taste and nutritional content but provides several distinctive features in cooking which includes emulsification, coagulation, foaming, and browning. Eggs are an excellent source of protein and consist of minerals and vitamins. Eggs are the ideal option included in a healthy balanced diet. But don't forget that it's a good idea to eat as varied a diet as possible. It indicates that we should be seeking to eat various foods every week to obtain the wide variety of nutrients we require. Eggs are an incredibly good supply of selenium, iodine, phosphorus, vitamin B2, molybdenum, vitamin A, vitamin B5, vitamin B12 and vitamin D.
The benefits of rice contain the ability to supply fast and instant energy, control and improve bowel movements, balance blood sugar levels, and reduce the ageing process, as well as supplying an essential source of vitamin B1 to the body. its too yummy, thanks for ur wonderful show, my father loves egg briyani, surely i try it, superb way of representation sir, my heart full thanks to ur cooking couples, happy cooking to both of u sir? Sir, Please make authentic mutton pickle for me. ...since Bakrid is coming soon. .I am visiting to my native place. So that I will prepare easily. ..Please. .Please. .Please ? I love your all recipes & jst wanna say u r the best ... :-)? what was that white liquid thing....? that u add after coriander n green chilli .? Sir pls how to cook rice for fry piece biryani i mean water measurments .? now I am hungry.i want to eat this..........looks yummy........gonna try it? sir how to cook veg and egg biryani without coriander and mint leaves. and tell how to prepare ome made biryani masala. pls reply sir.i like all ur receipes?